Currencies usually have units and sub-units, e.g. dollar and cents, or pounds, shillings and pence (or just pounds and pence nowadays), where dollars and pounds are the units and the smaller denominations are the sub-units. There are two ways of naming your lower denominations: either as a sub-unit, or as a fractional unit: 50 pence is a sub-unit, but a half pound is a fractional unit. Which countries have preferred the fractional unit? That is what this topic is about. 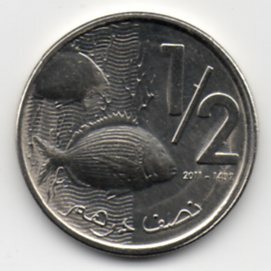 Mauritius: quarter rupee and half rupee. Albania, quarter lek and half lek, 1926. Albania under Italian occupation. 0.05 and 0.10 lek, 1940. Interim comment without images: Some countries use a mix of both. That is, lower denominations use "full sub-units" while the somewhat higher ones are fractional (main) units. Half Rupee and Quarter Rupee(Rep India) and you have same in BI coins also. Netherlands Antilles, 1/10 gulden 1970; ¼ gulden, 1954. The Netherlands also did quarter and tenth guldens for the Curacao and the Netherlands East Indies, but never a half gulden. A half gulden/guilder was issued in the home country from 1904 to 1930, along with 10 cents and 25 cents coins - never tenth or quarter gulden coins. 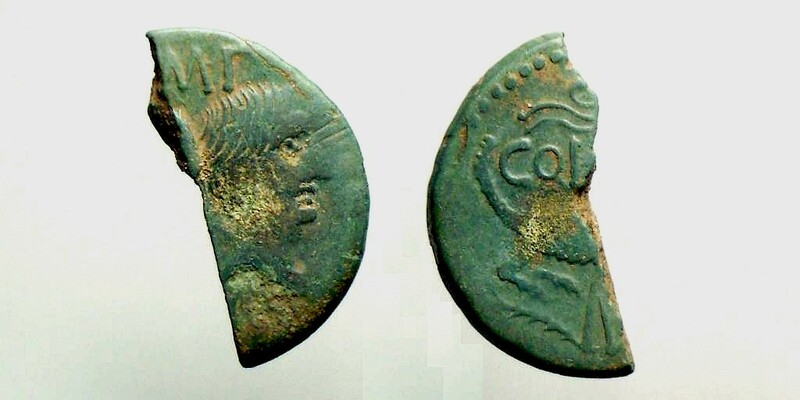 Nemausus in Gallia, 16-3 BC., Augustus, As (halved Dupondius), RPC 523 var. I find it interesting that the coin survives today as the 50-øre denomination, this time as the sub-unit instead of the fractional unit, but still the same value of 0.50 krone. The French denomination say"1C", but Chinese Denomination shows "One by Hundred", clearly a fractional number. Another Vietnamese Piece（French Tonkin), showing "One by Six Hundred". The use of the Chinese words "Tongbao"(or Thong Bao in Vietnamese, meaning Circulated Treasure) is uncommon here. The word is usually used together with the Emperor's Regnal Title (Bao Dai Thong Bao, Khai Dinh Thong Bao etc) or country name, or the mint's name, people usually don't simply put "Thong Bao" there. And the Hong Kong one mil coin. The thing is, the Chinese words they used for "One Mil" is exactly the word for "One Thousand"which inflated its value by 1000000 times, whereas it should be "One By a Thousand".